This is a guest blog post by Heather Temske, a 4th grade teacher at Sweet Apple Elementary in Roswell, Georgia. You can meet her in person at ISTE 2014 or follow her on Twitter at @htemske. I love any opportunity to incorporate mentor texts or model texts into lessons. Several years ago I watched an online session with Linda Oaks, an inspiring Tech4Learning Innovative Educator. In it she shared how she used Pixie with her ESOL students to create their own versions of several books. I loved the idea, and in my classroom we recreated It Looked Like Spilt Milk by Charles Shaw, Things That are Most in the World by Judi Bennett and The Important Book by Margaret Wise Brown with the Bill of Rights as the topic. Back at that time they were all created in Pixie and we printed them up and hung them in the hallway and exported a few as class videos. For the last two years we have been lucky to have Wixie subscriptions for all of our grade level students. This has made it so easy to work on projects from school computers or iPads as well as on their personal devices. It also allows the flexibility to finish something at home if required. Not only can they work on them online but it also gives the ability to share online as well. Working in Wixie gives us plenty of opportunities to get creative with the books we are reading, as well as provides opportunities for retelling, adapting, digital writing, and other connections to Common Core. Recently, we recreated Guyku by Bob Raczka and Peter H. Reynolds, a collection of seasonal haikus for boys. All of the students, boys and girls, wrote their own haiku for each season, created a Wixie page for each, pulled in the shared book cover modified for boys or girls, and a personalized name page. They selected the comic option when printing so they would come out with 6 images on a page. I then created a “Guyku” and “Galku” gallery to show off their work. Last year I even mounted boys pages onto blue bulletin board paper and girls onto pink. We also worked with similes, using two books by Hanoch Piven as inspiration. The first, My Dog Is As Smelly As Dirty Socks: And Other Funny Family Portraits is a fun book filled with portraits made out of objects that are tied to different similes used to describe the family members. The second, My Best Friend Is As Sharp As A Pencil: And Other Funny Classroom Portraits follows the same format, but focuses on a school environment rather than family. After reading both of the books, the students selected someone for which they would create at least four similes. These similes needed to somehow be tied into a portrait made with Wixie. The kids came up with lots of creative ideas for both family members and friends. Since I teach fourth grade, my students spend a lot of time reading their own chapter books, not just picture books. One of their favorite projects was creating book covers with recommendations for other students. The students decided on a favorite book they would like to recommend to others. Then they worked on recreating a cover with a summary of the book on the back. This could be done either on paper, or with Wixie using the paint tools, clip art, and text boxes. After the main covers were designed with an image and story summary/hook, student recorded an audio recommendation for the book. Depending on the year and the devices we have, we do this many ways. Students with iPads recorded in audioboo and pasted the url into a QR code creation tool. 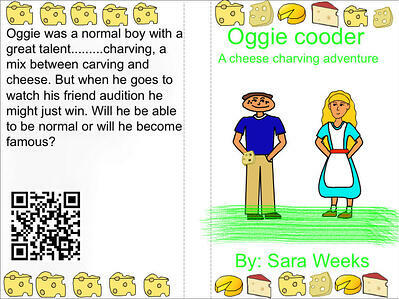 Students that had drawn the covers on paper went to a computer and did the recording in vocaroo since it can save directly as a QR code to be printed out from the computer and glued on the cover. While they were working I pulled a few students out at a time to pose for a picture. We printed them up and they cut and glued them on to their completed covers other students could also walk by, explore the covers, and then use the QR codes to hear a recommendation. I love that Wixie is so easy to use and the kids have the flexibility and tools to create literature-related projects they want to show off!